Training at the Bourem center: The campaign made uniforms for 800 students in 2016. Working under the watchful eye of a professional trainer the two women pictured on the right are learning the basics of tailoring – how to use a sewing machine, design a shirt or skirt, and cut cloth. It would take them at least 3 years of training to become truly proficient, but six months will enable them to produce piecework at a small tailoring shop in Bamako or Bourem. Tailoring is the second leg of the campaign’s training strategy and as with soap, many lessons were learned early on. The wrong material was purchased. The budget ran out. Sewing machines broke. But once these challenges were resolved the question was: what should the women make during their training? AP monitored this activity with great interest. We visited the Ecole C Doumanzana school in May 2016 to see uniforms being fitted (photo). In October 2016 we returned to another school, Ecole F. Djanguinebougou, to see the uniforms in use. We were curious to see if they were surviving the wear and tear of school life. 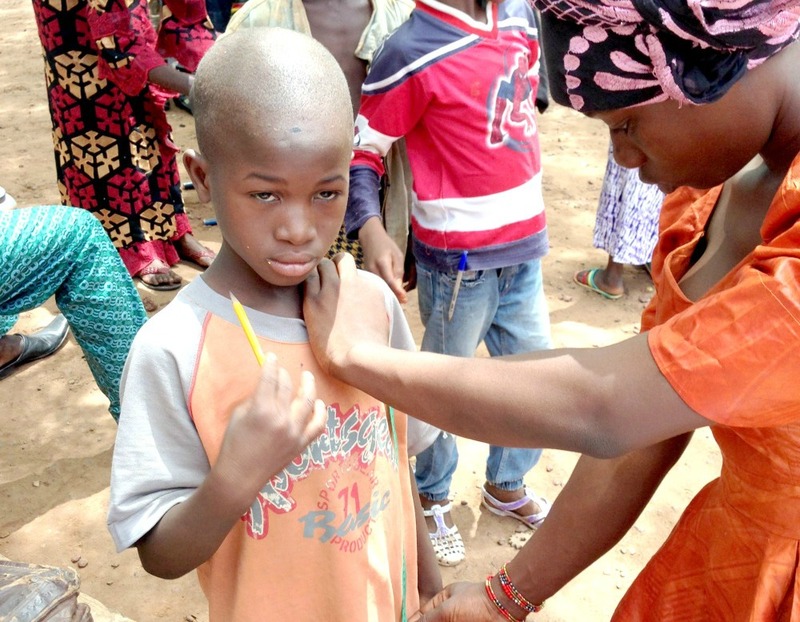 Issa, 8, is fitted for his school uniform by Ami M.
Happily, the answer was yes! We saw several uniforms in the playground and classrooms, and heard no complaints about quality. Vincent Douyon the head teacher had high praise for uniforms in general, which he said are good for morale and discipline. But, he continued, a uniform costs 6,000 CFA ($13) which puts it beyond the means of most families. As a result, a small number of his 1,100 students actually wear them. Sini Sanuman has provided the school with 43 uniforms, and there was some concern that these students would stand out and even be bullied. In fact, the uniforms look much like any other clothes and the lucky students seemed happy enough. Casana Fadija, 8, has grown in confidence with his new suit of clothes – his teacher said that Casana was so timid last year he was afraid even to come to school. Even so, the campaign will try and work in fewer schools in the future and concentrate on serving a larger percentage of students. While the uniform project on track, the campaign is wondering how to help trainees after their training ends. Not everyone will want to continue making clothes, but some have shown how it could be done. Sirandou S is a refugee from the north who was admitted to the Bamako center in 2014 and emerged with a passion for tailoring. 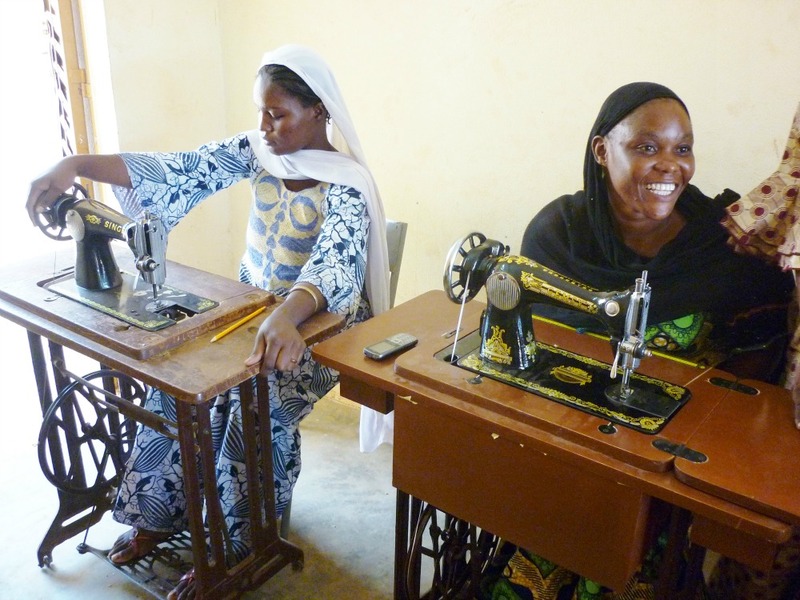 She persuaded her husband to part with 500,000 CFA ($1,000) and used the money to buy 18 sewing machines and set up a small workshop (called Nieta – “Go Forward”). Sirandou S trains women at her shop in Bamako. The Nieta atelier was a hive of activity when we visited. Sirandou offers training to 30 young women, who pay her 5,000 CFA ($10) a month for three years (photo). She also employs three professionals to make clothes for clients who bring the cloth and pay up to 22,500 CFA for a finished suit of clothes. A third of the profit goes to Sirandou, a third covers running costs and a third goes to the worker. When demand is high – at weddings or during a festival – each worker can produce three pieces of clothing a day. This adds up to a serious salary. Sirandou is an impressive entrepreneur. 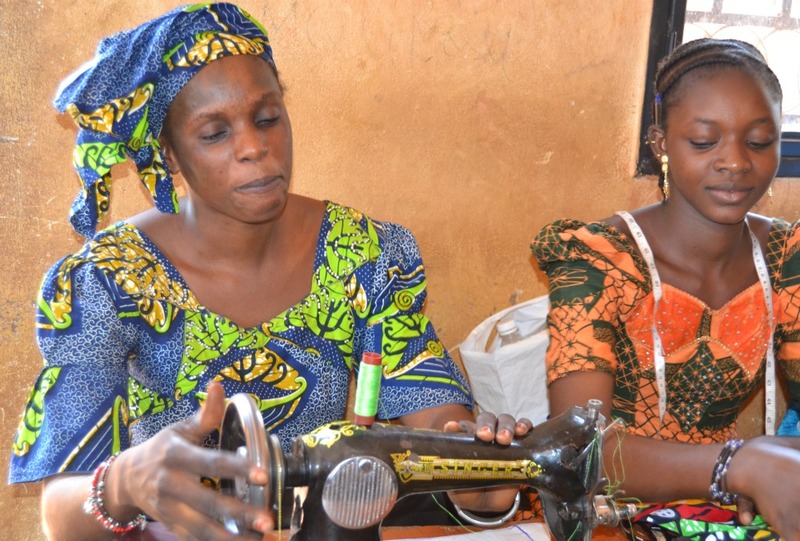 After watching her at work the campaign offered to buy her five more sewing machines and cover part of the rent if she will employ five trainees after they leave the Bamako center. That would create five new jobs and reward an outstanding former beneficiary from the campaign. Sirandou is happy to agree. Let’s hope it works out in 2017!